This year I think you should go camping. It doesn’t have to be the sort where you carry all your kit on your back for a 10 mile hike and call a muesli bar supper – let’s not go overboard! But getting outside, away from electricity, technology, the internet, is good for the soul. 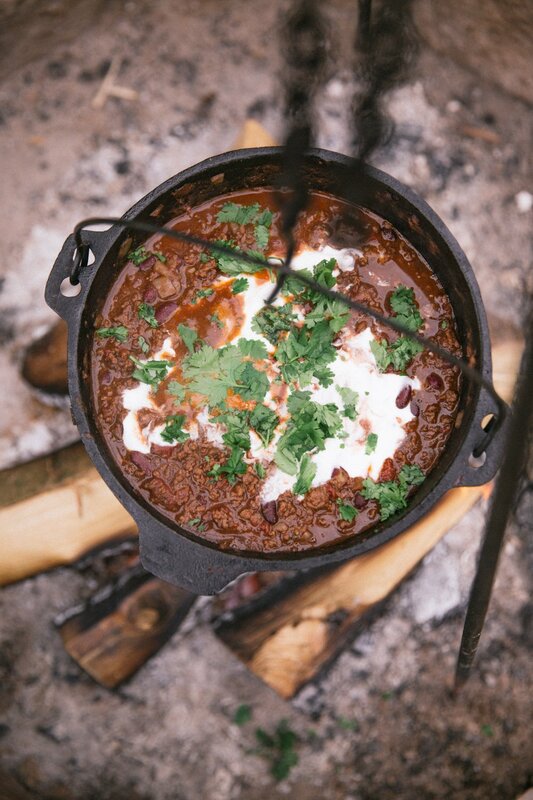 Sitting around a fire with some of your favourite people, tin mug of hot, spicy chilli in one hand, a torn chunk of hearty bread in the other and a tumbler of wine balancing next to you. That’s the stuff dreams are made of. Combine all your dry spices into small pot/jar. Seal and pack. Warm dutch oven over fire. You don’t want it blazing, best option is about half heat. Add oil, fry onions until soft. Add meat. Add spices. Add half glass of wine or cider. Simmer. Add tomatoes. Cover, cook for a couple of hours, stirring occasionally. You don’t want it to cook too fast, so either move to side of fire and turn now and again, or hang on tripod a little higher than the flames can reach. Once it’s been bubbling away for an hour or so check on it. It should be pretty thick with only a little liquid left. Throw in the contents of a tin of kidney beans. Cover and cook for another 20mins-ish. Once you’re happy with the consistency, you’re done! Put a pot of plain yogurt in the top, marble it around a bit but don’t stir in. Tear up some fresh herbs and throw on top. Ladle into mugs or bowls (maybe even some crusty bread rolls hollowed out into bowls?!) and serve. Finish off with a cuppa. And tie things up with a well deserved snooze. Camping doesn’t have to be all energy drinks and blisters, after all.